Enter the adventurous world of ancient Greek myths and see if you can conquer Medusa for a chance to win treasures beyond belief! Click here to play! While you're wandering the imagined lands of ancient Greece myths, you'll want to keep an eye out for Medusa. She's been turning men to stone and it's time to put a stop to her evil ways. Spin one to five of her symbol across an active pay line and you'll get up to 10000 times your line bet. She also acts as a wild symbol and will replace most others to help you bring in more wins. As a Grecian hero, you'll face plenty of trials, including facing an entire army. 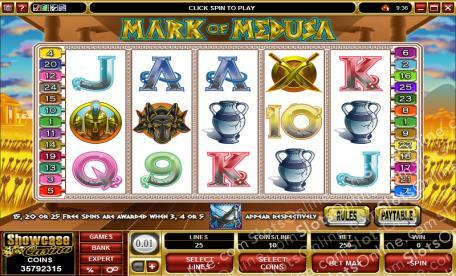 Slay two to five of the fearsome soldier symbols across a pay line and you'll get up to 1000 times your line bet. You'll also have to face Cerberus, the three-headed dog. Capture two to five of these canines and you'll bring in up to 500 times your line bet. Also helping you along the way are the golden shield and swords as well as Grecian urns. Watch out for Pegasus. This winged horse is here to help and will not only award you with a number of free spins, but will also multiply your total bet if you can spin two to five of him anywhere on the board. Step into the world of myths in this Grecian game and see if you can conquer beasts for a chance at a small fortune. The winged Pegasus acts as a scatter. Spin two to five of him anywhere on the board and you will multiply your total bet by 1, 4, 10, or 100 respectively. If you spin three or more anywhere on the board and you will trigger up to 25 free spins. Prizes are tripled during these free spins. Medusa acts as a wild. She will replace most other symbols (excludes scatters) to help you spin in more wins. She will also bring in up to 10000 times your line bet if you spin her one to five times across an active pay line.